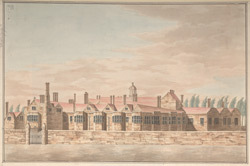 South east view of Astridge or Ashridge House, the seat of the Duke of Bridgewater in the parish of Pitstone, drawn about 1790. It is located in the Chiltern Hills on the border between Herfordshire and Buckinghamshire. During the middle ages an abbey was established here by the Earl of Cornwall, run by an order called the Bonhommes or 'Bluefriars' due to the colour of their clothes. The abbey was closed down in the 16th century and then became the temporary home of the young Princess Elizabeth. This is one of two views representing the richly decorated old abbey just before its destruction. The house and estate was acquired in 1604 by the Egerton family, who were Earls and Dukes of Bridgewater. It was pulled down by the Duke of Bridgewater around the year 1802, in order to make room for a new mansion built by James Wyatt in the Neo-Gothic style.